Adam Griggs, an aquatic ecologist for the Interstate Commission of the Potomac River Basin, talks about Tom's Creek's macro findings. He states that based upon the sensitive taxa found in the stream it could very well qualify as an exceptional-value stream. determine if anything is impacting or affecting the health of Tom’s Creek. It helps you focus on what you are trying to achieve with your monitoring program. It allows you to learn all of the components of the monitoring program before “getting your feet wet”. It clearly documents your sampling and analysis methods along with your quality assurance procedures. It helps you to select the most appropriate monitoring strategy to address the issues that are important to you, your group, and your community. It helps to inform new members about your monitoring activities. ​The monitoring plan should be revisited regularly to determine if the monitoring goals are still the same and to be sure that the data being collected are answering the initial questions that prompted monitoring. The Tom’s Creek watershed is 50 square miles and begins in the Michaux State Forest in Adams County, Pennsylvania. The stream travels 21 miles southeast through Frederick County, Maryland where it joins the Monacacy River (Potomac River/Chesapeake Bay/Atlantic Ocean). 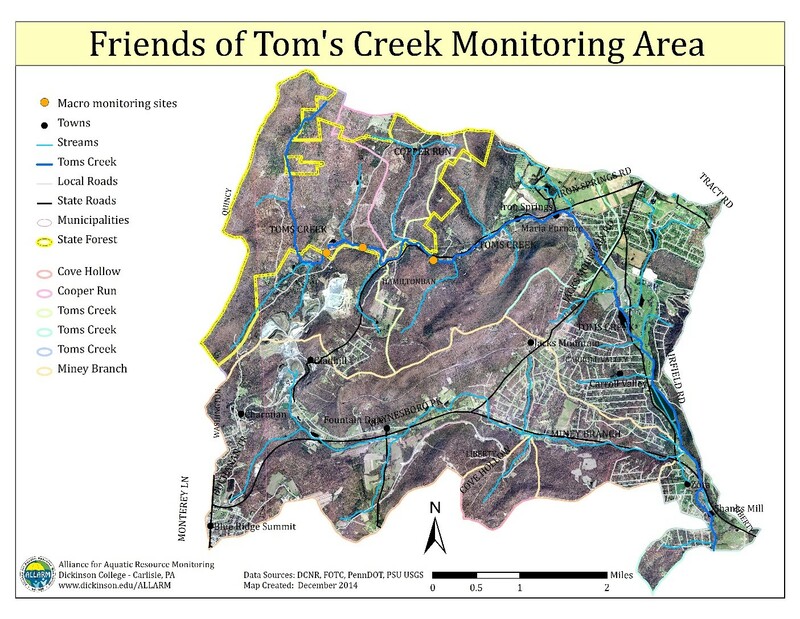 The Friends of Tom’s Creek are focusing efforts in the upper portion of the Tom’s Creek Watershed in Adams County, PA. The headwaters are found in a mostly forested area and are underlain by metamorphic rocks, primarily Greenstone schist, metarhyolite, and quartzite. The streams in this area are classified by the PA Department of Environmental Protection (PA DEP) as having a Cold Water Fishery (CWF) or High-Quality Cold Water Fishery (HQ-CWF) designated use. The area is home to species of concern such as wild orchids and brown bats, and the Pennsylvania Natural Heritage Program has listed it as a Priority Conservation Watershed. Data generated by the FOTC Monitoring Program will be used to determine if anything is adversely impacting Tom’s Creek. FOTC hopes to promote community awareness by analyzing the data and sharing the information that is collected. If the data shows that Tom’s Creek is being impacted, it will provide the data to the PA DEP for further investigation. Limited funds are currently available for the FOTC monitoring program. Volunteers monitoring turbidity have access to transparency tubes from the Adams County Conservation District. The Watershed Alliance of Adams County has agreed to allow FOTC to use their macroinvertebrate monitoring equipment twice a year for collection purposes. ​Volunteers will record all of their observations onto datasheets while streamside. At home, they will enter the data into an Excel spreadsheet for long-term storage. ALLARM will develop a tailored datasheet and spreadsheet for the FOTC Stream Monitoring Program. Volunteers to will e-mail a copy of their spreadsheet to ALLARM at the end of each calendar year.